This page is about chewy rodents with information on feeding for teeth health and protecting your property against damage. More information about feeding healthy chinchillas and degus is found on the feeding chinchillas and degus page and information on dental problems on the dental problems page. Rodents have teeth that grow continually; not just their front teeth, but their molars at the back. This is because their diet is naturally fibrous and low energy and requires a lot of chewing and grinding to start the digestive process. If their teeth did not grow then they would soon wear out. In captivity this means two things that hey need appropriate food and toys and that they can cause a lot of damage to their surroundings. As already said, rodents need to chew continually to keep their teeth in good condition. Some are more inclined to gnaw than others. Gerbils and Jirds are very destructive followed by degus and chinchillas, whereas guinea pigs tend to chew toys a lot less but browse continually on fibrous food such as grass and hay. Because their teeth are designed to withstand the continuous wear if browsing it would be ideal for guinea pigs to be out on the lawn all day every day. But in realisty this is not practicaland this means that they should be provided with an unlimited supply of good quality hay. 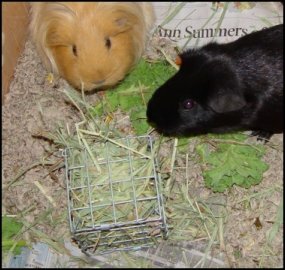 Guinea pigs are good eaters and although they enjoy posh timothy hays, the usually do just fine on a good quality medow hay. This should smell sweet and fresh and not be musty or dusty. We used to feed ours in a metal "hay cube". Degus and Chinchillas also need an unlimited supply of good quality hay. This is particularly important to grind down their molars (back teeth). They can be very prone to teeth problems, and so it is important to encourage them to chew and wear their teeth down continually. Chinchillas tend to eat more of the high quality Western Timothy type hays that are available and a good tip for getting them to eat more is to have several hays, alfalfa and dried grass and rotate them. Try the feeding chinchillas and degus and Pet Shopping page for more information on hays. Pellets and particularly, mixed foods designed for guinea pigs and chinchillas don't provide the wear that their teeth require and so once a chinchilla or degu is fully grown (and not pregnant or feeding) it is worth limiting the amount of pelleted food that they are given so that they have to eat their hay for a few hours each day. Guinea pigs usually eat hay very well and rarely need their pellets limited unless they are overweight. Mixed food (with different bits in) is not really a good idea. This is because they tend to pick out the bits that they like and leave the rest. This can lead to teeth problems because they aren't getting all the correct nutrients and/or the bits that they eat may be the easy to chew ones. If the only food that you can get is a mix then do not feed any more until they have eaten every scrap. Gerbils and Jirds do not browse in the wild but gnaw continuously and so require hard food and chew toys to keep their teeth healthy rather than hay. They can also be prone to selectively eating their food and not getting all of the nutrients that they need and since it is virtually impossible to get hold of a pelleted food for gerbils and jirds so the only solution is to try to make sure that they eat every scrap. This can be quite difficult when they tend to bury or store the food (degus can also hide food around the cage). The best bet is to only feed a tiny amount at a time. All small and furries also need varying amounts of fresh veggies which are important for dental health. For more information see the Feeding page. Degus, Chinchillas, Gerbils and Jirds should be provided with chew toys. There are loads of commercial chew toys available at pet shops try the Environment Enrichment and Pet Shopping pages for more ideas. They should always have something made from wood, or a chew stone such as pumice, in their cage. There is no doubt that rodents are destructive. For those that spend most of their time in their cage such as gerbils and jirds this tends to just mean that they need a tank or mesh cage and that toys should not be made out of plastic. Although I have never experienced problems with chewed plastic and they usually don't swallow it there is a theoretical risk of gut problems so are probably best avoided. Wheels used to be the biggest problem but the Wheels page has sources of metal ones. However chinchillas are often allowed out of their cage to play. And new owners often find to their horror that chinchillas will just as happily chew up the house as their toys. For those allowed out the rule is removal, protection, distraction. I take everything chewable out of the room - don't let them out with furniture you value. In case you haven't already worked this one out the rubber buttons on telephones and remote controls are just wonderful to chew off. Super glue will sometimes stick them back on if you can get them back from your little furry terror. My two will cheerfully shred house plants regardless of whether they are poisonous or not. 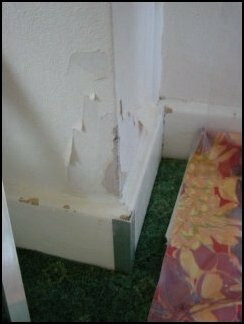 See below for a picture of what they did to my wall - they just love stripping wallpaper! Unfortunately I had to finish the job they had started, repair the wall and paint. Once I had re-decorated we needed to protect the wall and skirting boards from little gnashers. 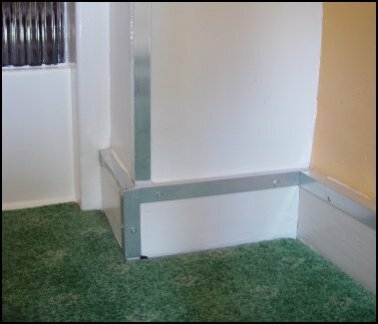 So we bought some angle aluminium from a DIY store and screwed it to the skirting boards and used sticky pads to fix it to the wall. Very effective and not that ugly (although it might be a problem when we come to sell the house - I will need to unscrew it and fill the holes). If you have an older house be aware that there may be lead paint on your woodwork and even if it has been painted over flakes swallowed by a chinchilla may poison it.The room also has large wooden doors in it. To protect this I have bought two large sheets of corrugated clear plastic from a DIY store, which I keep in the corner and lean against the door when they are out. You can also get sheets of Perspex which are designed for secondary double glazing which are very good for protecting things. IMPORTANT: WIRES. It is pretty much impossible to adequately protect wires from chinchillas. And every so often I hear of the sad case of someone's chinchilla being electrocuted. Even if this does not result in death, the chinchilla will have nasty burns in it's mouth and may not be able to eat properly. A chinchilla that has received an electric shock must go straight to the vets even if it appears ok. But avoidance is the best policy. Remove all electrical appliances from the room and even if you feel that you have protected a wire, make sure that it is turned off at the wall when they are out. You can buy a stop chew liquid that tastes really foul, however I haven't found that it works that well on things that are very tempting to chew such as skirting boards - generally they pull a face and chew away anyhow. Some people have used pens sold for puppies and rabbits to restrict the area in which their chinchillas can run in a room. Do not leave them unattended in these as there is always the risk that they will get themselves into trouble on the mesh. They can also be quite good climbers if they are determined to escape. Generally it isn't a good idea to leave a chinchilla unattended when out anyway - there's always trouble that they can get themselves into. Often people will let their chinchillas out in their bathrooms which is fine as long as you always keep the toilet lid down. It's all just too tempting and drownings can happen very quickly. It's actually worth having a house rule of always keeping the lid down even if chins aren't allowed out in yur bathroom - in case of escapes. Another idea is to provide as much distraction as possible by having a big pile of interesting stuff to play with. Old food boxes to explore, bits of wood or pine cones to pick up and run off with, a small amount of oats scattered around the floor to find. This can work quite well when supervised in a protected room - but they'll soon work out which bits are more interesting to destroy i.e. the stuff you don't want them to.